Since more than 60 years, PEDI AG is a competent partner for the nuclear industry all over Europe. The company is specialized in developing, manufacturing and selling of protecting and shielding products for persons and environment. During the dismantling process of radioactive contaminated equipment, components or building structures, the use of tight housings or encasements is necessary, stopping the distribution of airborne particles and dust. For this purpose, PEDI uses flexible housing materials with high mechanical properties and certified for the use for alpha-tight encasements. A so called dismantling tent serves as a work place for cleaning or maintenance or dismantling activities. Particularly, it can be used for storage or handling of radioactive substances in solid, liquid or gaseous condition. 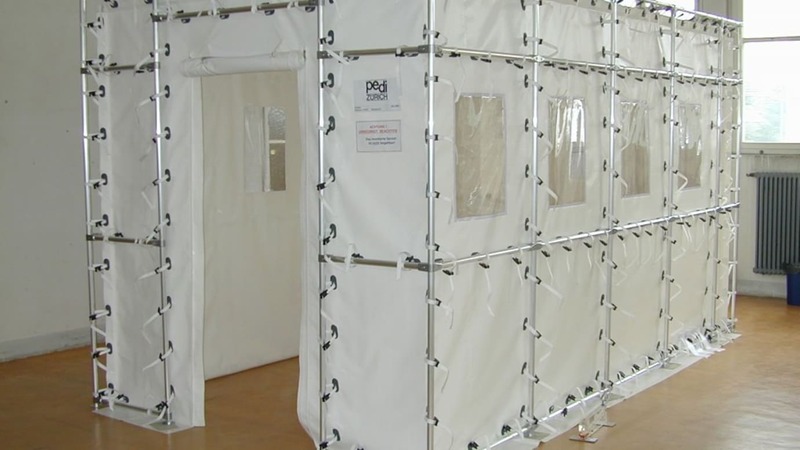 The decontamination tent includes a solid frame structure and a flexible housing. The frame structure remains completely outside of the tent, so it remains free of contamination. The inner space of the housing is completely empty and easy to clean. The housing is permanently evacuated down to -200 Pa. After use, the tent housing will generate a minimum of waste in weight and volume. In the field of Personal Protective Equipment, a vast range of established protective suits and auxiliaries is available: Depending on the method of operation, the suits are designed for integral ventilation or to wear with mask, for single or multiple use, for light or heavy works. For the ventilated suits, a breathing air supply is needed. The PEDI air supply and air distribution components are engineered for high reliability, durability and long live cycle. Due to these characteristics, PEDI products assure an immediate readiness for operation at every time. Airborne particles can be collected with a variety of air samplers, test swabs (smear tests) and screening tests, allowing an efficient air monitoring right around the clock. More information on www.pedi.ch .